NRMCA's periodic reporting of ready mix production across the U.S. prompted The Concrete Producer magazine to conduct a poll on how producers are faring this year. Editor Tom Bagsarian would like your input and will report the findings at a later date. Read more. A new stormwater management system made its debut earlier this month in a Pittsburgh neighborhood that's been the site of the some of the city's most severe flooding in recent years. Designed in partnership with the city and Penn State Center: Engaging Pittsburgh, the system uses pervious concrete and a garden, known as a bioswale, to capture and purify water. Source: July 21 article by the Pittsburgh Tribune-Review. Read more. Bridge-in-a-backpack? Say what? Well, the University of Maine is researching an "innovative inflatable composite-concrete arch bridge," which it cleverly describes as bridge in a backpack. The technology is more than a decade in the making from the university's Advanced Structures and Composites Center. Researchers there say that the technology can reduce construction time and costs, potentially double the life span of bridges, reduce maintenance costs and significantly reduce the carbon footprint of bridge construction. Source: AGC SmartBrief for July 17 which included a July 13 article from the Bangor Daily News. Read more. A bit of recent economic good news came from the Lone Star State with a report stating that the value of all Texas home sales reached $40 billion in 2011, a figure that is directly in line with 2004 sales. An economist who studied the data said it showed a housing recovery in Texas. Home inventory levels in Texas are down to six months, compared to 6.5 months or slightly higher during the real estate downturn. As inventory levels decline, prices recover and grow higher. Source: A July 5 posting on HousingWire.com. Read more. In a ceremony on Wednesday, July 11, Washington, DC, Mayor Vincent C. Gray celebrated completion of the District’s first "green" alleys. The Green Alley Pilot is part of the mayor’s Sustainable DC initiative to make the District the nation’s greenest, healthiest, most livable city. The alley project — a partnership between the District Department of Transportation (DDOT) and the District Department of the Environment (DDOE) — is aimed at reducing the quantity and improving the quality of stormwater runoff within the District’s right-of-way. "Improving the health of our rivers and streams starts in our neighborhoods with creative solutions like these green alleys," Gray said. Many alleys include a significant amount of impervious surface, but most do not have stormwater controls (such as water quality catch basins or grate inlets). To mitigate this, green alleys use sustainable design and Low Impact Development (LID) techniques that reduce the amount of stormwater and pollutants entering the sewer system, streams and rivers by increasing water filtration and treatment on site. Three initial Green Alley Project sites are included in DDOT’s pilot program. DDOT constructed its pilot green alleys by replacing gravel, impervious concrete, or asphalt surfaces with pervious concrete. NRMCA Senior National Resources Director Phil Kresge worked with Neil Weinstein of the Low Impact Development Center, to assist in pervious concrete design and specification. Additionally, Kresge provided pervious concrete training to DDOT personnel. With the first alleys now completed, DDOT is monitoring the three sites to determine the effectiveness and durability of the materials. DDOT will also be constructing a fourth green alley later this summer and has eight additional alley locations in under design. The project is funded through a combination of local dollars and funding received from the American Recovery and Reinvestment Act of 2009 through the U.S. Environmental Protection Agency. The total cost for the first four alleys is $1.2 million. For more information about the Sustainable DC vision, visit http://sustainable.dc.gov or contact Phil Kresge at pkresge@nrmca.org. 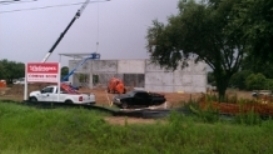 The picture here taken by NRMCA Senior National Resource Director Vance Pool shows a new Walgreens under construction in League City, TX. "Tilt up construction is nothing new, but surprisingly many parts of the U.S. have not developed a market," Pool said. "Most think it is only economically viable for warehouses and that it is ugly. There are many retail centers in Texas which have ornamental details rivaling the best Venice, Italy, has to offer at a fraction of other material costs." "With advantages on first cost and resilience in tornado and hurricane prone areas, it is amazing that people’s misconceptions have slowed tilt-up construction's growth in so many places," Pool said. "Naysayers argue it can’t be insulated easily, but that argument also holds no water. Many engineers don’t take advantage of the structural properties of concrete and put steel columns just inside the walls, adding cost and reducing competitiveness. With our markets still recovering from the recession, tilt-up construction is a great place to grab market share from competing materials." If you don’t have a market in your area, partner with a contractor from the Tilt-Up Concrete Association. For more information, you may also contact Vance Pool at vpool@nrmca.org. With excellent keynote speakers, high quality general sessions, 14,000 square feet of exhibits, the annual National Mixer Driver Championship and Washington, D.C. for a backdrop, NRMCA’s ConcreteWorks Conference & Board of Directors Meeting has plenty to offer every industry attendee - and there are special rewards for those interested in concrete promotion and sales. This year’s Concrete Promotion Track features a vital session to assist producers in winning local parking lot projects of national retailers that are now seeking quality concrete bids, as well as several sessions for developing business through expanding market opportunities (local streets) and applications that deserve a fresh look (RCC and concrete overlays). Add in a session to help you spread an understanding of how concrete’s resilience is a virtual prerequisite for sustainability, and the ever-popular "What Works in Concrete Promotion" rapid fire presentations from conference attendees, and you have a compelling educational mix for industry promoters and sales professionals. Click the link above for general information about the conference. Please contact Glenn Ochsenreiter at glenn@nrmca.org for more information about the Promotion Track or to register for a 5-minute presentation in the "What Works" session. NRMCA's national resource directors have an upcoming Webinar that focuses on concrete parking lots. Click on the link below to learn more or contact NRMCA's Jessica Walgenbach at jwalgenbach@nrmca.org. The preliminary estimate of ready mixed concrete produced in the U.S. in May 2012 is 27.5 million cubic yards, 16% higher than in May 2011. The estimated production through May is 108 million cubic yards, 18.2% higher than during the same period in 2011. Ready mixed concrete production is estimated from cement shipments reported by the U.S. Geological Survey. Additional details are available for NRMCA members on NRMCA's Web site. Nominations to fill the seats of seven expiring terms of the RMC Research & Education Foundation Board of Trustees are now being accepted. The Board will hold an election to fill the expiring terms at its next meeting taking place on Wednesday, September 26. To nominate an individual for the Board, please contact Foundation Executive Director Julie Garbini at jgarbini@rmc-foundation.org or at 240-485-1150. Nominations must be received by Friday, August 10. For more information about the work of the Foundation or to view the Board of Trustees Position Description, please visit http://www.rmc-foundation.org. Save the date, Thursday, September 27, to attend the 2012 Annual MIT Concrete Sustainability Hub Research Progress Update for Industry and Key Stakeholders in Cambridge, MA. The theme of this year's event is Research With An I4 Sustainable Change. The MIT researchers have developed groundbreaking models over the last three years and now is the time for stakeholders to Invest themselves in the research results and models, begin to Innovate their own design and manufacturing processes based on the findings, Invigorate their various constituencies to learn and apply the methodologies and, finally, Implement sustainable change. The program will start with a Welcome Cocktail Reception on the evening of Wednesday, September 26. The morning session on Thursday, September 27, will include presentations by MIT Researchers working on the Concrete Science and Building Technology Platforms including Life Cycle Assessment and Life Cycle Cost Analysis of Pavements and Buildings. Lunch will be provided at noon followed by afternoon breakout sessions where interested stakeholders and representatives may provide feedback and ask questions of the researchers. Registration is $195 and includes the reception, lunch, coffee breaks and materials. Please click here for more information and to access the registration form. The MIT Concrete Sustainability Hub was established by the Ready Mixed Concrete Research & Education Foundation and Portland Cement Association. ASTM International has published ASTM C595-12, Standard Specification for Blended Hydraulic Cements. The recent revision defines requirements for a new cement type: Type IL, portland-limestone blended cement, which includes more than 5% and up to 15% limestone as an ingredient. This technology has the potential to reduce environmental impact of cement production by about 10% while maintaining performance characteristics concrete producers are familiar with. Similar cements have been used in Europe and other places around the world for several decades and have demonstrated the performance and durability expected in concrete products. The revision represents the results of several years of cooperative effort by the Joint AASHTO-ASTM Harmonization Task Group, and was endorsed by the Portland Cement Association's (PCA) Product Standards and Technology Committee and Standards Subcommittee. Similar requirements have been approved by AASHTO’s Subcommittee on Materials for AASHTO M240. The update to M240 is scheduled to be published next month. As part of a broader quality initiative, NRMCA’s Research Engineering and Standards (RES) Committee has been developing brief technical information topics packaged as ‘Technology In Practice’ (TIP) sheets. The NRMCA TIPs are modeled on their popular NRMCA counterpart, the Concrete in Practice (CIP) series. While the CIP series was developed as basic technical topics for the ready mixed industry to use with customers or others involved in concrete construction, the TIP series is written for ready mixed concrete industry personnel to support internal education on general quality control/quality assurance and technical topics. •	TIP 5 — Capping Cylindrical Concrete Specimens with Sulfur Mortars and Unbonded Caps – summarizes the key points in the applicable standards for capping strength specimens and the reasons for these requirements. •	(NEW) TIP 8 — Concrete Yield – outlines process for determining yield of concrete and evaluating problems with yield. Portions of each TIP topic can be viewed and purchased on the NRMCA Web site or contact Jacques Jenkins at jjenkins@nrmca.org or 888-846-7622, ext. 1165. NRMCA Senior Vice President of Sustainability presented Innovations that Enhance the Sustainable Attributes of Concrete-based Materials at the fourth International Congress on Ceramics held last week in Chicago. A ceramic is defined as an inorganic, nonmetallic solid prepared by the action of heat and subsequent cooling and can have crystalline or partly crystalline structure (such as porcelain or cement) or may be amorphous (such as glass). Attendees at the conference include researchers and practitioners in the field of ceramics and since concrete is made with cement, many are interested in innovative applications of concrete. Lemay was an invited speaker for the infrastructure track at the conference. Lemay presented advances in products such as pervious concrete, high strength concrete, self-consolidating concrete, flowable fill and roller-compacted concrete along with other conventional concretes that can enhance the sustainability of the built environment. He also discussed recycling efforts of the concrete industry, including cementitious materials, aggregates and water. Efforts to reduce carbon footprint of concrete, including high volume replacement of cement with fly ash and slag cement were discussed. Initiatives such as LEED, the Architecture 2030 Challenge for Products, and other standards that challenge product manufacturers to measure and track carbon footprint and other environmental impacts were explained. The presentation also included a brief review of research being conducted at the MIT Concrete Sustainability Hub designed to quantify and reduce the environmental footprint of concrete. For more details, contact Lionel Lemay at LLemay@nrmca.org or 847-918-7101. For information regarding the MIT Concrete Sustainability Hub, visit www.rmc-foundation.org. A host of publications across the ideological spectrum have reported on presidential politics, transportation, infrastructure, regulation, heath care, taxes and other subjects, each of which relate to the ready mixed concrete industry. To access these articles for the week of July 16 - 20, please click here. Truck Mixers Driver's Manual (Spanish Version also available) - This 74-page manual educates truck mixer drivers about concrete and customer relations. It also highlights driver duties, safety precautions, equipment inspection and maintenance procedures, and what the driver should do in case of an accident. Order online today English or Spanish and receive 25% off: regular member price is $14, Internet Special $10.50, plus shipping. English-Spanish Translation Manual - This 96-page, concrete-specific, glove box-sized, English-to-Spanish booklet addresses communication challenges on the job site. It includes common words, photos and phrases, each with its own phonetic pronunciation, commonly used during a job site pour. Order online today and receive 25% off: regular member price is $14, Internet Special $10.50, plus shipping. Please use Discount Code ISJULY12 to receive the online discount.